The prolific artist Judy Darragh and Grant Major, the Oscar-winning production designer behind The Lord of the Rings on arts education and working the ranks in creative fields. 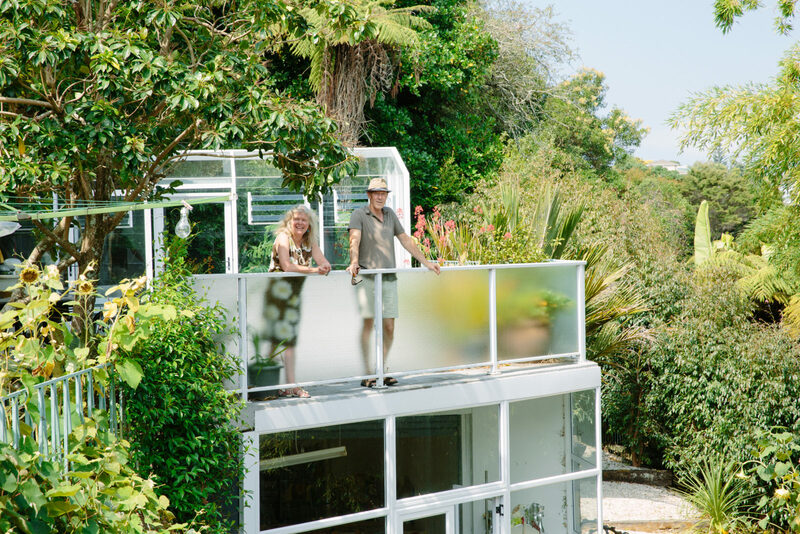 Judy Darragh and Grant Major have lived together in their three-level modernist house in Auckland, New Zealand, for the past eighteen years. During that time, the house has seen the couple and their 21-year-old son Buster through multiple art-show openings, school projects, home-studio renovations, and industry parties. The shag-pile carpet and ceiling rosettes have long since been removed from the home’s interior, but the spirit of family remains: found inside their kitchen cupboard doors are height markers spanning several decades. As one might imagine, Major and Darragh’s interiors are a visual extension of both of their creative minds and lifestyles. “It’s history through object, everything has a story,” explains Darragh. Traded art, props from film sets, and kitsch or found objects bulge from their shelves. “The rule is: if it’s a bargain, get it,” she claims of her maximalist displays. As an artist who explores large-scale sculpture through found and recycled objects, Darragh’s endeavours have gained her the title ‘Queen of Kitsch.’ Her love for art stemmed from childhood, growing up on the South Island of New Zealand in Christchurch. Her mother she describes as “a maker, industrious, and unafraid of hard labor” and a father who worked for the freezing works and was in the labor union: “They would go on strike at every opportunity, so there were always a lot of socialist and political discussions at home,” she adds. “In high school, I had two amazing art teachers, they were different to the other teachers, and I identified with them,” she explains. Seeking out environments that allow for discourse with other artists is vital to Darragh’s practice. For the third time she will attend a residency at the Montalvo Arts Center in Saratoga, California, for a three-month stint with the Lucas residency program. This time, Major will accompany her. The residency experience will be a first time for him, and a welcome interlude between one long-time project finishing and the next starting. Avid collectors Major and Darragh played with the thought of buying a Futuro house, a plastic reminiscence of Space Age idealism, designed by Finnish architect Matti Suuronen in the late 1960s. But becoming an artist “was an intuitive passion,” Darragh claims, which she followed through “until I could write ‘artist’ as my occupation on the departure card you fill in when you leave the country.” Other events significantly altered the course of her career: Having a child “definitely put the art world into perspective for me, and I’ve never used time so well as since then.” And Darragh’s retrospective exhibition, ‘So, You Made It?’, curated by Natasha Conland at New Zealand’s national museum, Te Papa, was a huge opportunity for the artist to view her past works in overview and context, offering both direction and reflection. As a production designer, Grant Major draws a lot of inspiration from the dramatic coastlines and landscapes of New Zealand. One of his favorite spots is not too far from their home: Muriwai Beach. Even with her significant roles in the development of local artistic initiatives, and with works displayed in public art galleries and museums, such as her dazzling meteorite-like forms for Limbo installed at the Auckland Art Gallery, Darragh tells me there are still many frustrations for artists here in New Zealand, especially female, and they are yet to be truly heard or represented. “I am still having the same conversations with my 80-year-old writer friend as I am with a painter who is 30 years my junior. As a more experienced artist I feel responsible for addressing issues surrounding the underrepresentation of female artists in institutions, awards, and collections.” She continues, “for example, The Designers Institute of New Zealand awards two black pins per annum, its supreme award. The Best Design Awards over the past 20 years have awarded 43 black pins: 40 to men, three to women.” Judy’s face is overcome with a look of weary shock. Find out more About Judy Darragh’s call to action to New Zealand artists and learn more about Grant Major’s work. More people from the creative fields talk about their background, inspiration and work in our interviews section.